Today is an exciting day, because we have our first international Gluten Free city guide! At The Food Diary Co we know eating out in a new city is an exciting and terrifying prospect in equal measure. So we're getting our favourite gluten free/low FODMAP/Dairy free folks to tell you their secret favourite places to eat in their cities! "Being diagnosed with Celiac Disease during my first year of nursing school was a bit rough. A heavy academic schedule and a completely new diet/lifestyle was a lot to adjust to. But with a great support system behind me, I was determined to continue my normal life, just with a new gluten free spin. So before a night out, dinner, or anything that involved food, we were researching New Hampshire places with gluten free menus or even just some knowledge of the disease. Believe me when I tell you that gluten free options have come a long way since I was first diagnosed. The quality of the food was of course important to my experience, but my best indication of a true gluten free spot, was the way I felt the next day. Anyone who has been the victim of cross-contamination knows what I mean. Needless to say, this list is not only the establishments that I feel have exceptional allergy-friendly menus, but also the ones in which I felt no effects of being “glutened” the next day. Stella Blu is a modern little spot right in the center of Nashua, New Hampshire. Although they’re best known for their tapas and martini bar, I personally love their gluten free menu. Their GF options are numerous & the staff make you feel welcome and confident with ordering & questions. I live for their ravioli dish, which you would never guess was gluten free. Their decor, coupled with mood lighting provides a high-end atmosphere and weekly live music amplifies the energetic, night-life feel. It is my favorite spot to meet my friends for apps (Note to UK folks: those are appetizers/starters!) and drinks before a night out as it sets the tone for a fun night. It’s location is close to tons of unique bars on Main Street, making it a true, New Hampshire gem. The Mile Away is located exactly one mile from the center of town in Milford, New Hampshire. It’s grounds are beautifully landscaped, and they’re known to host a lovely wedding. This rustic spot, housed in an old colonial barn has a gorgeous menu, with Swiss inspiration; they offer 5-course dining, and to my delight, had a full gluten free menu. My favorite dish is their escargot, with it’s rich wine sauce. It’s cozy atmosphere is only heightened by the giant fire place, which you can see from nearly every seat. It’s a go-to among my family for celebratory dinners, but is also a perfect spot for a dinner date night. The Friendly Toast has locations in both New Hampshire & neighboring state, Massachusetts. My favorite is located on New Hampshire’s coast, in Portsmouth. It’s a hip & eclectic eatery with almost a diner feel. The menu is enormous, and has multiple GF options. 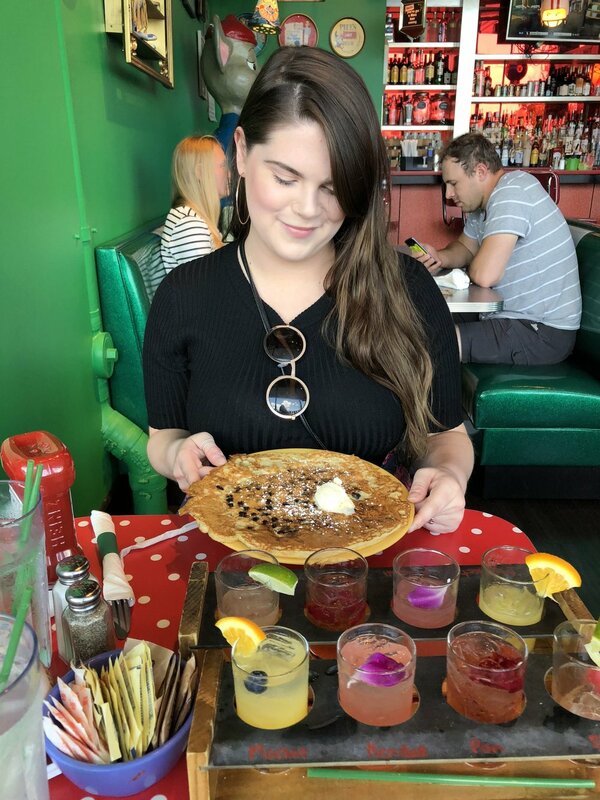 I’m a sucker for their pancakes that are nearly the size of your head. They have a unique array of drinks and during my latest visit, I tried their mimosa flight, which did not disappoint. The bold colors & their funky decor add to the cool, casual vibe. It's the perfect spot to grab brunch, but opens early for those early birds out there. But if you want breakfast food during a night out, they have a full bar & hours that run until 2am on Friday and Saturday. It's a one-of-a-kind place. Pressed cafe is another brilliant little spot in Nashua, New Hampshire. It’s close to the mall and other shopping areas. It’s a casual, hip spot for quick, quality food. My favorite item is their goat cheese BLT served on a wonderful gluten free wrap. They have many gluten free, dairy free and vegan options and an amazing raw juice bar. Their carrot cake juice blend is a must-try item, and so fresh!! It’s a rather cozy space, so the seating is first come, first serve. I like to go here for a casual bite for late lunch after errands and they have super easy take-out options. I'm wondering how I lived my life happily before discovering this place. The Common Man is a New Hampshire specialty, with 6 locations. It has a rustic feel, as the restaurants are located within redone barns or colonial homes. They have fine dining options, and a bar area as well. Both menu’s have wonderful gluten free options & I’m a big fan or their “Almost Escargot” dish, which is mushroom caps doused in wine & butter sauce. Their dim lighting and relaxed atmosphere make it a perfect spot for a family dinner, or my personal favorite, catching a football game with drinks & appetizers. Every location has it’s own little personal New Hampshire flair and is a state-wide staple. Thank you Elizabeth for this brilliant gluten free tour around your home; all of these places sound incredible! If you haven't already, go follow her on Instagram - you can find her at @glutenfreebroad.